Fresh from French designers La Tête Au Cube comes this hi-tech doormat, which does many things to a person's crib. For starters, it says "Beware Of The Nerd" in a fairly charming way. It will show you to your door no matter how many Flaming Sambucas/microdots/spliffs you've had the (mis)fortune to consume on your travels. 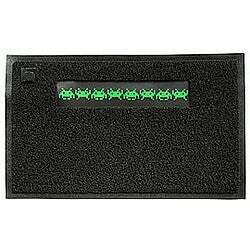 Door(mat) tax is $110 and you'll need a couple of AA batteries to make the little green men strut their spacey stuff outside your door.